Dr. Audra Rickman graduated from North Carolina State University with a BS in Animal Science and a doctorate in Veterinary Medicine. She has lived in Southport since 1996 with her husband Tommy. They have two children: Grace, an avid softball player, and Bailey, a classical music fanatic. They have two dogs: Fiona, a rescued pitbull, and MacGregor, a Caviler King Charles Spaniel. Dr. Audra loves Broadway musicals, traveling, and cooking. Dr. Nancy Marchetti graduated from Vassar College in 1982 and Cornell University College of Veterinary Medicine in 1986. She moved to Southport, NC in 2006, with her husband and daughter, along with 2 dogs,3 cats, and a horse. Dr. Nancy enjoys horseback riding and gardening. Moved to Oak Island in 1981. She has five children and eight grandchildren. She has been married to her husband for over thirty-five years. She doesn't have any pets because she enjoys taking trips to the mountains on her motorcycle. She has been at Four Paws since they opened in 2006. Sarah was born in Wilmington but lived in Brunswick County all her life. She has two children and a husband she has been married to for over 12 years. She has 3 dogs and 2 cats that have all come from rescue groups. Toby is one of her dogs that get to come to work with her every day. she enjoys spending time with her children and husband doing fun activities. She has been at Four Paws since they opened in 2006. Beth was born and raised in Brunswick County. She has a small dog, named Bentley and a cat named Piper. She is very loving and compassionate towards all animals. She loves taking her kayak out during the summer time and in the evening she loves watching a good show on Netflix and doing crafts. She has been at Four Paws for over 7 years. Kaitlin was born and raised in Brunswick County. She has a son named Landon and a dog, named Hank. She has a passion for animals and has always dreamed of working with them. She enjoys spending time with her son while taking him out on their 4-wheeler. She has been working at Four Paws for over 2 years. Kim moved to Brunswick County in 1999. She has a dog named Ace that enjoys coming to work with her every day. She is currently taking classes online to get her Vet Tech certification. She loves to watch a good game of Jeopardy in the evenings after a busy day at work. She has been at Four Paws for over a year. Citrus and Spice are the 2 resident cats. 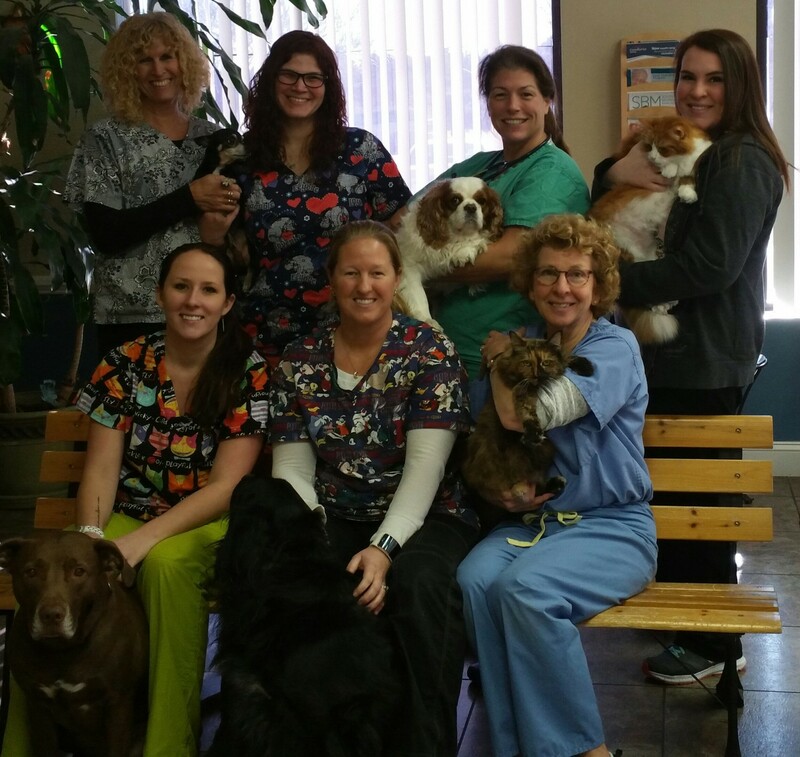 They stay at Four Paws Veterinary Hospital. They both came to Four Paws as abandoned cats on Oak Island. Soar brought them here to get them fixed. As soon as Dr. Rickman picked Citrus up and started rubbing his belly she knew that they both belonged here. So in 2007 Citrus and Spice became family members of Four Paws. 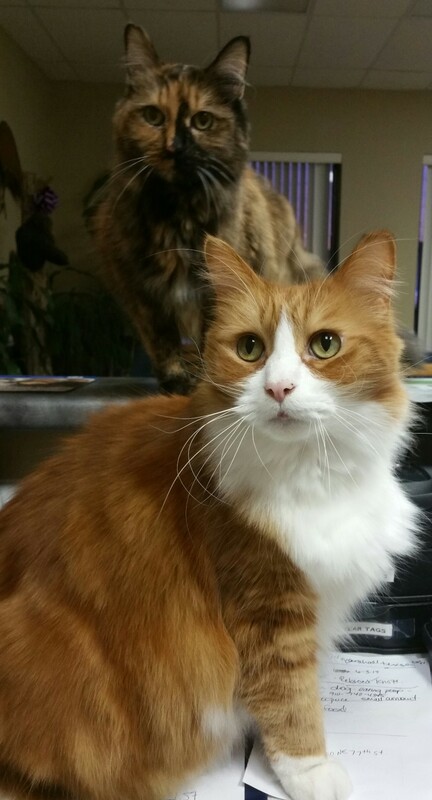 They are both loving cats and enjoy meeting out clients either at the front door as they walk in or they will greet you at the front counter. There has not been a dog yet that has been able to move them from their favorite spots for napping.